I was personally a little bit suspect about the name of this recipe. 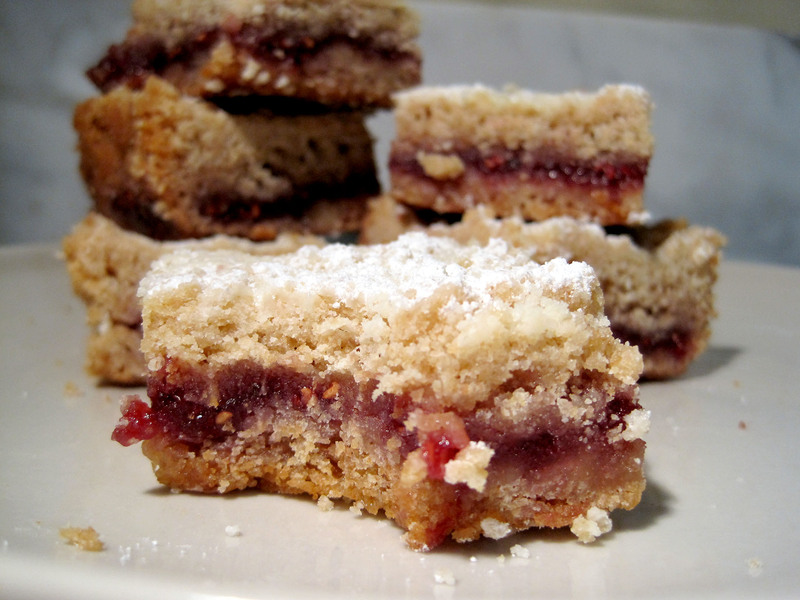 What’s so Austrian about raspberry jam and shortbread? I guess it’s a variation of a traditional raspberry shortbread cookie, but raspberry jelly and shortbread is such a ubiquitous combination that I wouldn’t even think it was Austrian in origin. I guess you could say that their product has now been genericised! 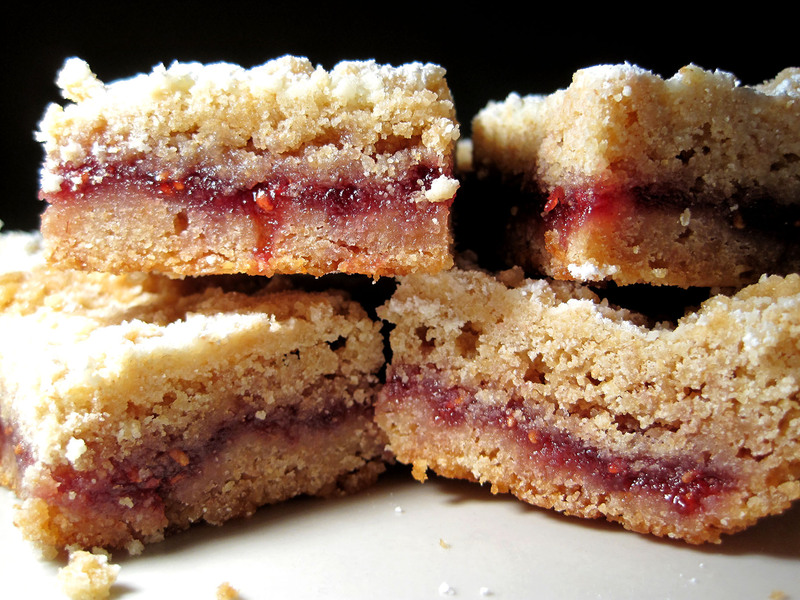 This recipe is a riff on traditional raspberry jelly and shortbread biscuits usually offered during Christmas, because it appears in a bar form instead of cookie form. If you think stamping cookies is time-consuming and would like to cut back on effort by resorting to this recipe, let me warn you that this recipe would only reduce your effort if you had a food processor. I do not own one. In order to achieve the airy, crumbly crust, I had to grate a big ball of frozen dough by hand. It took some elbow grease, for sure. Still, the fruits of my labor were much appreciate. These cookies were really delicious. Grating the shortbread gave it a fluffy and crumbly airiness, which gave some lightness to what would have otherwise been a dense and buttery shortbread. The shortbread could’ve used some brightening from lemon zest, which I unfortunately didn’t have. I also imagine that the raspberry jelly would do really well with a dash of Austrian 80-proof Stroh rum. 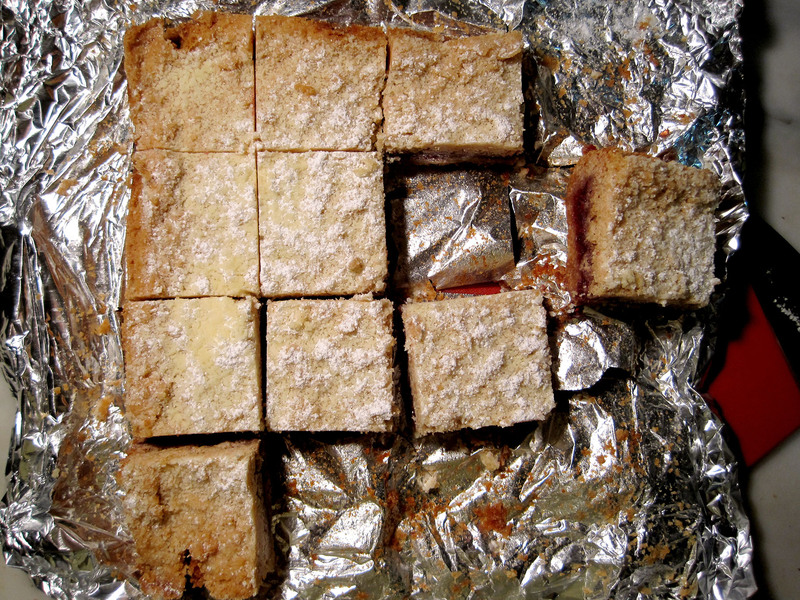 It also looks so pretty; the scarlet red of the raspberry jelly poking through the crumbly shortbread. No wonder it’s such a common festive season staple. Cream the butter in a mixer fitted with a paddle attachment (or using a hand mixer) until soft and fluffy. Add the egg yolks and mix well. Mix the granulated sugar, flour, baking powder, and salt together. Add to the butter and egg yolk mixture and mix just until incorporated and the dough starts to come together. Turn the dough out onto a floured work surface and form into two balls. Wrap each ball in plastic wrap and freeze at least 2 hours or overnight (or as long as a month, if you like). Line a 9×9 inch baking pan with parchment paper or greased aluminium foil, with an inch overhang. Remove one ball of dough from the freezer and coarsely grate it by hand or with the grating disk in a food processor into the bottom of the pan. Make sure the surface is covered evenly with shreds of dough. With a piping bag with a wide tip or a zip-lock bag with the corner cut off, squeeze the jam over the surface as evenly as possible, to within 1/2 inch of the edge all the way around. Remove the remaining dough from the freezer and coarsely grate it over the entire surface. Bake until lightly golden brown and the center no longer wiggles, 50 to 60 minutes. 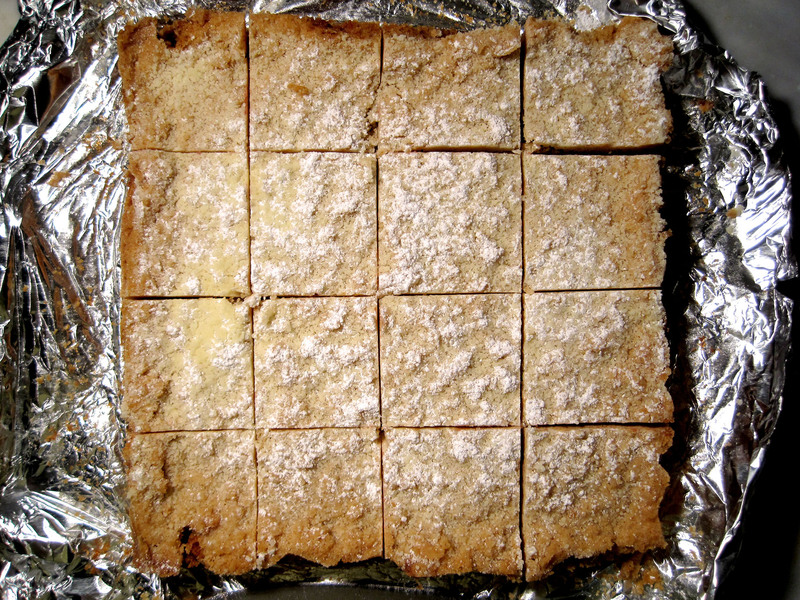 As soon as the shortbread comes out of the oven, dust with confectioners’ sugar. Cool on a wire rack, then cut in the pan with a serrated knife. Chill the pan in the fridge before cutting to get clean slices. P.S. Here’s a GIF of the bars, sliced and moved around. I couldn’t resist.